This week’s minorities in cartoons entry is Hulkling (real names: Theodore “Teddy” Altman/Dorrek VIII). Hulkling first appeared in “Young Avengers” #1 (April 2005). He was created by Allan Heinberg and Jim Cheung. Hulkling’s backstory states Teddy was born as “Dorrek VIII,” the son of a Kree man and a Skrull woman. The woman was a princess, as the daughter of the Skrull Empire’s emperor. For the uninitiated, the Kree and Skrull are longtime alien races in the Marvel universe. The Kree are an alien race whose world is a Klingon-esque military culture, and whose members possess superhuman strength. The Skrulls are shape-shifting (and more villainous) aliens. The latter have frequently crossed paths with the Fantastic Four and the larger Marvel Universe. The Kree and Skrull have been at war with each other, as shown in the classic “Kree-Skrull War” storyline. Upon learning his grandson was half-Kree, the enraged Skrull emperor ordered him marked for death. However, the infant’s nurse secretly took him to Earth. There, Teddy had an otherwise mundane upbringing, with the nurse posing as Teddy’s adoptive single mother. Eventually, Teddy discovered his superpowers, and later joined the Young Avengers. Later, the villainous Super-Skrull (a Skrull with all the powers of the Fantastic Four) came to Earth. The Super-Skrull revealed Teddy’s true origin and heritage as heir to the Skrull Empire. During this encounter, Teddy’s adoptive mother was killed. Soon, the Kree also came to Earth. As the son of a Kree warrior, Teddy was to come back to the Kree homeworld for training. (Teddy’s the son of Marvel’s original Captain Marvel.) A brief battle occurred between both sides. Before long, both alien races were (basically) tricked into heading back to their own worlds, with Teddy remaining on Earth. Hulkling later met, and entered a relationship with, fellow teammate Wiccan, a male youth with various magical abilities. As for the name “Hulkling,” Teddy’s superhero identity resembles a teenage version of the Incredible Hulk. However, the two aren’t related. 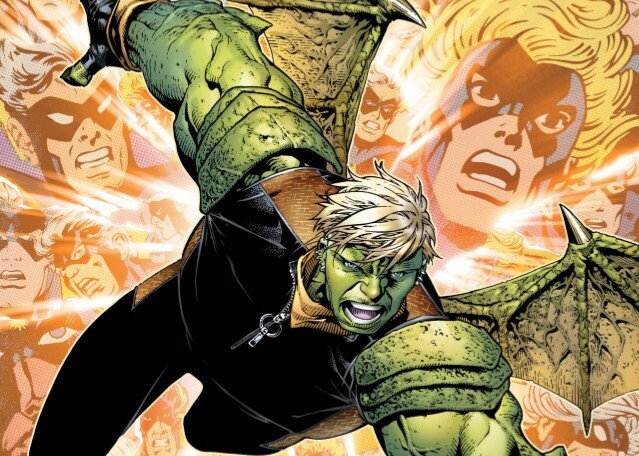 Hulkling’s powers are, of course, a mix of both Kree and Skrull abilities. These include shapeshifting abilities, stamina, and super-strength. Outside of comics, Hulkling appeared in the “Lego Marvel’s Avengers” video game. Scott Whyte did Hulkling’s voice. It’s safe to say Hulkling and Wiccan are the two most popular members of the Young Avengers by far. That’s at least based on the high amount of fan art I saw while writing up this post. They’ve not only made a big splash with fans, but also outside of the world of comics. The “Young Avengers” comic has won two GLAAD Media Awards (in 2006 and 2014) for positive mainstream portrayals of LGBT characters.